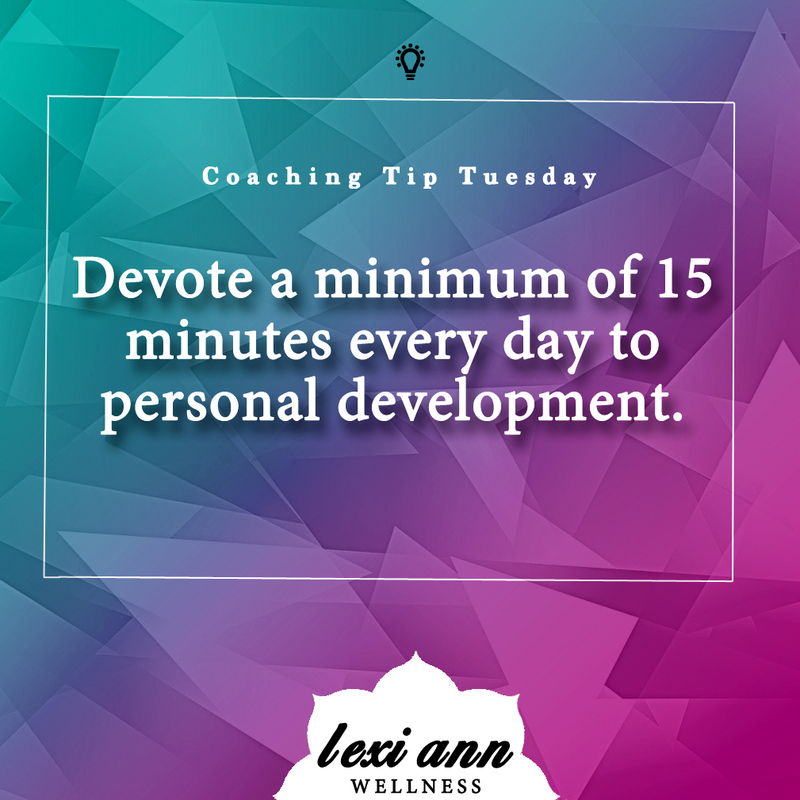 Coaching Tip Tuesday: Devote a minimum of 15 minutes every day to personal development. You have to show up for yourSELF before you can show up for anyone else. There are countless ways to engage in personal development, whether you decide to pray, practice yoga, meditate, read, journal or watch inspirational videos, etc. the most important thing is that you commit to some sort of PD each and every day: consistently is key. Personally, I prefer starting my day with personal development before anything else (after brushing my teeth of course). This sets a productive tone of positivelty for the rest of the day. Although I recommend personal development to everyone it is especially vital if you’re a coach or apart of our #freetobefit team. For coaches, I highly recommend participating in the Coach Training Academy that’s on your beachbody coaching homepage. If you’re interested in more information regarding this shoot me a comment or e-mail! Everyone’s PD is different, and that’s okay, even if the type of personal development you engage in is different each day, that’s okay too- what matters if that you take time, every single day to take care of yourself, improve yourself and make strides towards growth! For example: My own personal development consists of daily prayer, meditation and yoga- more recently I’ve expanded this to researching/acting on improving marketing and branding. Mondays are the National Coach Calls, so that is my personal development on that day. Either way, I hit my PD in the mornings with a cup of tea right after my workout + shower. Don’t be intimidated by my lengthy list of what I do for PD. It’s a huge part of my life but it hasn’t always been so lengthy- my PD started small and yours should too! I’d LOVE your feedback on what you do for personal development. Do you consistently have something you work on, on a regular basis? If you don’t- what sort of personal development intrigues you- even if it’s something other than what I’ve listed? DO share and let me know what sort of PD peaks your interest. We have all tried different diets, taken off weight, put it back on, started new workout programs, quit them, joined gyms, stopped going, etc. This challenge right before the new year is meant to get you grounded and on track. My team gives you the support that you need to make a lifestyle change and reach your full potential, why wait until January 1st? If you are ready to commit to change reach out to me. I am so looking forward to seeing everyone’s awesome results this month and can’t wait for mine, good luck! When I wake up, when I drive, when I meditate, when I cook, when I eat, when I work, when I teach and when I sleep I play mantra. Okay, so it may not be exactly 24/7 but it sure is close! Why? This is a funny question as I type it because I feel as if you truly want to understand the why, you must learn by experience and saturate yourSELF in mantra. How do you use mantras in your daily life? Do you listen to mantras during the day? What is the most profound thing you have experienced during chanting? If you have any questions about mantra leave a comment below! Do you have questions about mantras in Kundalini Yoga – their pronunciation, where they come from or what they mean? I decided to post a review of the five day Jus cleanse since most reviews covered are on the 3 day cleanse. I prefer the five days because I think it takes about 3 days to get situated and enjoy the process of cleansing. 3 days are certainly good for new cleansers however if you’ve done a cleanse in the past, I would definitely recommend challenging yourself with the five days. Before the Cleanse: I cannot recommend enough the importance of weening yourself off unhealthy habits i.e., eliminating meat, dairy, alcohol, caffeine, processed food, sugar and wheat. Simplifying your diet to consist of primarily plant based whole foods will make the cleansing process much more enjoyable. During the Cleanse: Focus on self-love and follow your intuition. Your body and mind are releasing toxins while on a cleanse. You may find yourself irritable, having a short fuze or more tired then normal. These are all normal!!! Listen to your ego when negative thoughts arise and simply let them go. Spend time in nature, meditate, get extra sleep (your body will want it during a cleanse), and drink half your body weight and ounces of water per day if not more! I also recommend daly self-massage (I do dry brushing in the morning and use sesame oil at night) and detox baths which I talk about in my Ayurvedic Cleansing Post. Biggest Advice because I cannot reiterate enough: Drink lots of water, I drink 32 ounces right when I wake up (after brushing my teeth of course) and then rinse each Jus bottle and fill it up with water and drink after every jus. My second tip would be to ease into the cleanse. Third, get sleep! Your body is riding on toxins and this takes a lot of energy so you’ll need extra sleep the first couple of days on your cleanse. Fourth, take care of your SELF. What does this mean? Spend time in nature, turn off electronics after sundown, massage yourself, meditate, laugh, gentle twists/yoga, pray, read something uplifting, and recall all that your grateful for and finally make an effort every single day to smile. After the Cleanse: Just as you eased in, easing out of the cleanse is an equally important aspect of having a truly successful cleanse. Adopting healthier habits then you had going into the cleanse will be very beneficial. You don’t want to shock your body with processed food, sugar, caffeine or alcohol. Try new recipes, get out your food processor, be thankful and enjoy feeling refreshed. You’re doing your SELF a favor by cleansing when the seasons change (fall and spring) but you’re also demonstrating to others the importance of self-care. Without even saying so, people will notice the shift in your energy and the new lightness you bring. With so many different cleanses out there, listen to what your body wants and you’ll be guided to the right path whether it’s an Ayurvedic cleanse, whole-foods cleanse, juice or smoothie cleanse, each of us have different bodily make-ups allowing each of our processes while cleansing to be unique. Enjoy the process, surround yourself in mantra, release and refresh.